WASHINGTON (CNS) — Community land trusts are celebrating their 50th anniversary in the United States in 2019, and Catholic figures had a role in their development. Based on a concept developed by Mahatma Gandhi in India, these kinds of land trusts were originally designed to allow black farmers to pool their resources to own the land they farmed rather than work as sharecroppers, according to Jason Webb, a senior specialist in community and capacity building at Grounded Solutions Network, a nonprofit firm that fosters community land trusts. A black Catholic priest, Father Albert J. McKnight, was one of the early supporters of the concept. So was John Lewis, once an activist with the Student Nonviolent Coordinating Committee before he became a Democratic member of Congress from Georgia, and the Southern Christian Leadership Conference. Webb said the first residents of Covenant were members of a sewing cooperative that was created to provide people income after a mill was shuttered. “They sold their stuff by the roadside,” he added. A community land trust features dual ownership, according to Webb. The land trust owns the land, but the resident owns the improvements to it — that is, the house. A community land trust can take advantage of the federal Department of Housing and Urban Development programs to provide seed money to buy land and build housing. It also can help close the “wealth gap” between the asking price of a house and what the would-be buyer can afford, Webb said. This loan is forgiven if the homeowner stays in the dwelling for an agreed-upon minimum number of years. The forgiven loan adds to the homeowner’s wealth should he or she decide to sell it back to the land trust. Community land trusts can be single-family housing or apartments. 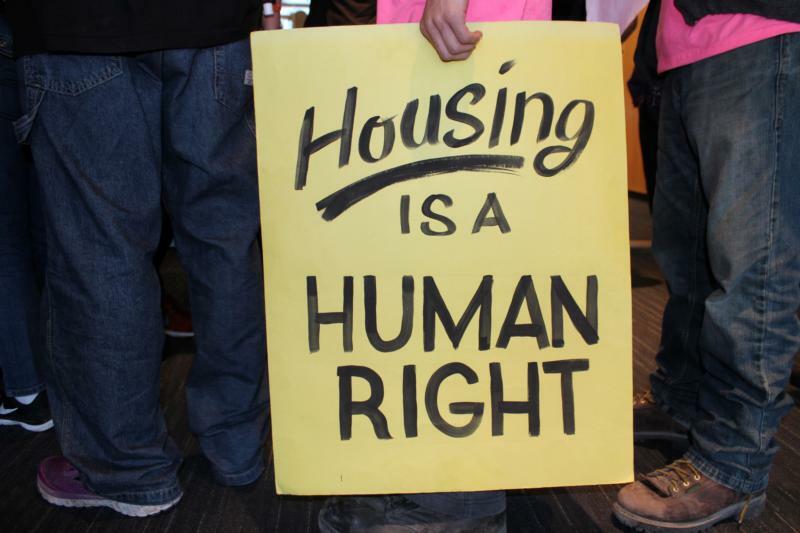 Webb pointed to a community land trust in Burlington, Vermont, that sets aside a fixed number of units for renters with Section 8 housing vouchers. Speaker Kenneth Demus said the Lexington, Kentucky, neighborhood in which he and four generations of his family before him lived was converted to a community land trust when the neighborhood was slated for demolition for a road project. After residents mobilized and protested, a Lexington city official “stumbled on” the community land trust concept, said Demus, a Grounded Solutions Network resident ambassador. There was still one hitch: The neighborhood would be spared, but houses would still have to be torn down for the seven-year construction project. The city agreed to give the new community land trust vacant land adjoining the neighborhood and erected temporary housing. Demus said when the road project was completed, new housing was built. Residents then had their choice of buying the new house or staying in the temporary house. Over the course of the project: Demus’ circumstances had changed: He had gotten divorced and was raising his four children as a single parent. He opted for a new house. Since moving back to the old neighborhood, one of his daughters has had a child, “so now there’s seven generations of my family” who have lived there, he said.